Churn Milk Hole is our first 'hole' of the day. A massive collapse doline next to the Pennine Way - it has formed on a fault which crosses the area east to west including the two holes we shall visit later. Note here how the great scar limestone is covered by a layer of glacial drift, like the top layer of icing on a cake. From this angle the joints and bedding planes in Churn Milk Hole can be clearly seen - as can the way Penyghent sits proudly on the 600 feet thick limestone plinth. Enlarging of prominent joints by solution in the limestone beneath, over a massive period of time, has caused the surface rock to collapse inwards and form the hole. This is how the lion of Ribblesdale dominates the scene on the Pennine Way. Just beyond Churn Milk Hole, the way on is over the rough moorland behind this signpost - the only way it isn't pointing - as we want the first part of the adventure all to ourselves. If we head about 200 metres over the tussocks, we'll meet the corner of a wall next to the first of the day's truly breathtaking natural wonders .. and it doesn't even have a name! (SD833718) A dotted line indicates the path on the OS map. We've just come in from the left to reach the wall (this view is looking south) and if you look carefully there's the lip of a hole in front where things look a touch greener. This colossal hole in the landscape must be double the size of Churn Milk Hole, and on Google Earth it looks like a massive bomb crater. Cavers have likened the fragments of limestone in the bottom to sugar - so I call it the Sugar Basin. There's a sketchy way down on the left ... see how long it takes you to walk round the rim. The strange thing is with these kind of features - you don't often notice them until you're about to fall in! Such is the size of the Sugar Basin that even Penyghent looks precarious, as if she's about to be swallowed up by the monster. Hands up if you're now a member of the Sugar Basin fan club? Many attempts have been made to connect the hole with other well known cave systems. Who knows what secrets may lie beneath? From the Sugar basin, walking directly west and keeping Ingleborough in our sights as a guide - we soon drop over the brow of a hill and this view opens up. Of course the trees hide another wonder - you knew that! Lined up on the same fault as the other two, Larch Tree Hole is more a conventional pothole, formed by a now absent stream. It's about 15 metres deep and surrounded by a wall so our woolly friends don't fall in . Having said that, it's full of bones, farm debris, bits of corrugated iron ... oh, and more bones .. This view is from the west side, with the green slope of descent clearly seen. I had my first brew of the day under that old sycamore at top left. Lovely. Leaving Larch Tree Hole behind, we head north along the wall. This view is looking back to the lonely scene - the only trees for miles around - and not a human in sight. When they have been around here, though, they've done some pretty strange things. Notice the sheet of rusty iron? This covers a hole known as Gavel Rigg Pot - and the spoil the cavers have dug out of it is neatly walled in on the right. It doesn't lead in very far, is too narrow for me, and is yet another attempt to connect the underworld beneath Penyghent. We soon cross the Three Peaks route up from Horton (SD831728) and continue north along the wall until this wall is met coming up the field (SD828733). The trick now is to turn sharp right (in the direction of the camera) to locate an obvious dry valley just a few metres to the the east. It'll be worth it .. This innocent looking hole is the most daunting, notorious and exhausting stream pothole in Great Britain - the stupendous Penyghent Pot. The 'boulders of dubious stability' described in Northern Caves - have been made safer with scaffolding. The cave was discovered in 1949. You can just see the stream glinting below. Some cavers can spend 12 or more hours in this pot, and the tiring thing is they have to come out the same way. The first hour is a trying crawl in a freezing canal, followed by a backbreaking low passage - still in water - and then a horrendous series of underground pitches and waterfalls including the Niagara and Friday the 13th series. 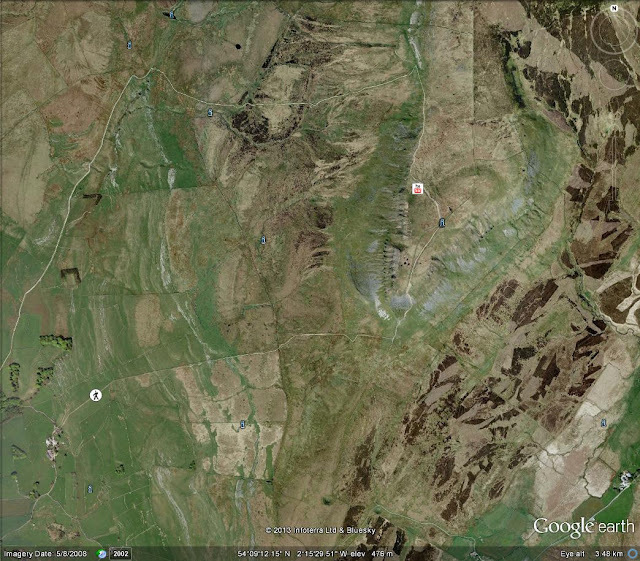 In total - there's 5.2 km of passage in Penyghent Pot. I love caving, but I wouldn't think about this one ... and I admire those who have done it. Sitting as innocently as it does in this tiny dry valley - you would never believe it! Leaving the pot, we keep along the wall until bogs force us to move eastwards slightly (towards Penyghent), and then we cross a beck and scramble through the couchy heather until we once again meet the Pennine Way. We'll be following it up to the summit later, but first let's divert down the track to the left and pick up one of the greatest potholes in the country ... don't let children rush ahead, as this one is a death trap ..
Hunt Pot (once 'Thund' Pot) is everyone's idea of what a pothole should look like. Here the beck rushes off the Yoredale slopes of Penyghent and has hollowed out a huge single joint in the Great Scar limestone. Take great care. To the left of that boulder at bottom right is a concealed 'eye-hole' that drops 30 metres to the foot of the shaft. Today the water had formed a mass of ice crystals in the depths and was truly beautiful. Clambering with great care across the stream bed, we get this fantastic view in. The hidden eye-hole is just behind that small wedged boulder in the top corner. The hole has never been known to fill up. The first 30 metre drop leads to a suspended floor with another drop into the bowels of the earth - then the passages become too constricted for exploration. Have a look at the quintessential Yorkshire pothole in the flesh! The first waterfall into the Hunt Pot chasm is pretty enough - the poor water having no idea of the hell that awaits it. Perhaps the more cowardly water droplets prefer to delay their descent into hell by being frozen in time. 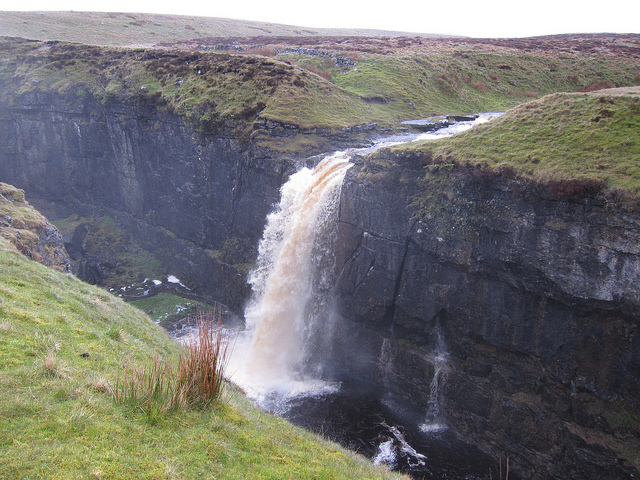 A last goodbye to a truly awesome natural wonder - but can Penyghent go one better than that? Oh yes indeed! Oh .... my ... Gollums!!!! Hull Pot - 270 feet long and 60 feet deep, pales into insignificance all other surface openings in the UK - or Europe, for that matter. Formed on a fault - it has been ground out by water action from a stream which, nowadays, only plunges into the chasm after flooding. Like this - for example. There is no way into the hole, except with full climbing gear. In extreme floods it fills completely and even overflows, causing chaos ... but what a view with Penyghent behind. Here we are standing on the normally dry river bed at the lip of the fall. We've been neglecting the lion all this time - so head back to the Pennine way and turn left for an uphill slog. Eventually limestone cliffs are reached. The top-most layer of limestone in the Yoredale beds, the Main Limestone - is thicker than it is on Ingleborough, and lies just beneath the gritstone summit. It is very fractured - and has allowed such features as the Penyghent pinnacle to form. A cracking object! First humans of the day - and they were stuck on the ice with a four year old. They moved 50 yards in 50 minutes. Scary! Never underestimate the Three Peaks. Reaching the summit of any mountain is special - especially when you have it all to yourself. That's Fountains Fell behind. We are now at 2237 feet - but it feels like 20 000 in the winter. And this guy permanently is .. The Old Man of Penyghent. Big nose, hasn't he? Freeze thaw action has resulted in huge hunks of gritstone cascading down the mountain . - one to remember for a long time. Here's the entire route on Google Earth. Parking is just under the 'G' of Google at bottom right (honesty box) and the Pennine Way can be seen snaking its way past Dalehead farm in a northwesterly direction to the left of the 'G'. The hole where the path turns at a sharp angle is Churn Milk - and the even more obvious Sugar Basin is clear above the word 'Ltd' - bottom centre. Larch Tree Hole, a small black gash can be made out to the West of Larch Tree, some way above the 2 in 2013 - and then the wall can be followed northwards to two 'i' signs: the first being Penyghent Pot and the second, close to the path - Hunt Pot. The massive opening of Hull pot can be seen as an 'i' at the top of the picture, covering the dark chasm. The limestone pinnacle of Penyghent is situated on the swathe of limestone at the top of the photograph, slightly to the right of centre. Enjoy!